Vague ideas about Greek hospitality, food and culture do not take long to solidify to a firm love for the country. My notions of Greek life at the start of my Fulbright year in Athens just one month ago are not concepts anymore but what I know. The way my neighbors interact, the way a stranger seeks to befriend and cater to Americans or how my students greet me—passion moves with their words and gestures, teaching me the ways of Greece and its people. Shane Kleier, a 2018 Master of Arts in Teaching graduate, received a Fulbright U.S. Student Program award to Greece. Kleier, a native of Trumbull, Nebraska, is supporting the teaching of English at the Hellenic American Education Foundation as part of the Fulbright English Teaching Assistantship program. He went abroad in September and will be in Greece through July 2019. After the Fulbright program, Kleier plans to return to Nebraska to teach in language arts in an elementary school. 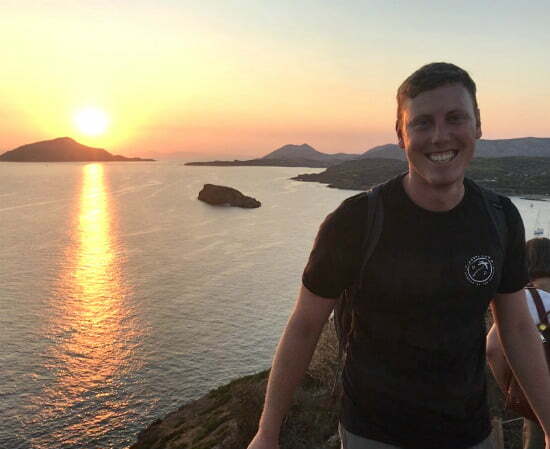 Shane Kleier (MAT ’18) at the Temple of Poseidon during his Fulbright experience in Greece. For me, graduation was so recent. Being hooded for my master’s came shortly after my return to the U.S. [Kleier spent seven weeks student teaching in Canberra, Australia, before graduation in May] and before I knew it, another foreign country became home again. Here my life is decidedly different as events like garden parties with diplomats and attachés seem almost routine. Yet just a year ago my routine meant classes at Hastings College. A trip to the U.S. Embassy when you are treated as a colleague is rewarding. It impresses upon me the value of my work as an ambassador for the United States and as a teacher. The students I work with and the locals I encounter, though they may convey themselves differently, have the same needs and desires as my American students and friends. Humanity’s purpose is universal. The more I see of the world, the more I hold that idea. And with each passing week, I get to see more of Athens and explore the rest of Greece. Seeing the Parthenon sit atop the Acropolis, though a regular occurrence, still carries a sense of awe and excitement as there are so many side streets throughout the Plaka where I walk and stumble upon an ancient temple, with the Parthenon overhead. Already I have stumbled into someone I know from back home, right beside the Temple of Zeus. The chance encounter feeds my curiosity to explore and learn. To see other cities, islands, parts of the world so often untrodden, and meeting people from around the world will continue as my Fulbright year goes on. I look forward to meeting America’s ambassador to Bulgaria in the coming month, as well as a fellow Nebraskan who is part of Macedonia’s Fulbright delegation. Surprising connections keep developing as I become more and more Greek, admittedly a slow process, but a good one. Conversely, the more I get to know Greece and Eastern Europe’s part of the world, the more I can identify with my American heritage. The connections are infinite but my identity is not definite. I will continue to evolve with my growing understanding of Greece and its people.